When preparing metal structures for coating and painting, flash rusting can present a significant problem as it sets in very quickly on steel that has been newly blasted, especially when sandblasting or other conventional dry blasting are methods are used. This flash rusting, if not checked and controlled, can fatally undermine the integrity of steel marine structures, boats, ships and machinery, as well as causing protective coatings to fail. Flash rust is caused by salt deposits on the surface of newly-blasted metal (a constant hazard in marine environments) which, when mixed with water, cause corrosion cells to form. The problem is also exacerbated and accelerated in humid environments. However, in wet abrasive blasting (also sometimes known as vapour blasting or simply wet blasting) water encompasses the blast media and this is fired at high pressure at the surface; this combination of blast media cushioned by water means that soluble salts are not left on the blasted surface as the water dissolves them and then washes the salt away. Therefore, steel that has been prepared for re-coating by using wet abrasive blasting is not at the same risk of flash rust as it would be if sandblasting or other methods of dry blasting were used, as in these methods the blast media is directed at the surface by high air pressure only and without water, meaning that soluble salts and other contaminants can be left, to a greater or lesser degree, on the surface. When you profile a surface using wet abrasive blasting, you are also effectively contributing to the ultimate success of the protective coating that’s applied. This is because after blasting, the surface isn’t entirely smooth but is rather covered in minute peaks and valleys, which means the coating adheres better by filling these valleys and also covering the peaks. 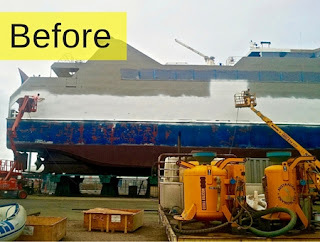 Therefore, if other contaminants are present on the surface of a structure or vessel when paint or a protective coating is applied, this will ultimately compromise the integrity of the coating; however, the process of profiling using wet abrasive blasting means that nothing is left on the substrate to interfere with the coating, either physically or chemically. The type of protective coating to be used, as some require a more profiled surface than others to be effective. The right sort of profile for both the substrate and the coating needs to be achieved. For instance, if the ‘peaks and valleys’ (known as the anchor profile) on a blasted surface are too large, the coating may not cover the highest points, with pinpoint rusting being the result. On the other hand, if the profile is too smooth, then the coating may not be able to anchor sufficiently well, and its effectiveness will therefore be significantly reduced. Wet abrasive blasting utilises a variety of different blast media, both in terms of the size of the abrasive and the material, and this versatility is why the precise anchor profile that is specified for any job can achieved using this process. Why is wet abrasive blasting more effective at profiling and surface preparation than sandblasting? A significant disadvantage of sandblasting and other dry blasting methods is that because the blast media is not encased in water as it is in wet abrasive blasting, this can in fact drive contaminants such as oil and grease into the substrate, rather than cleaning them off, while parts of the blast media itself can become embedded in the substrate if blasting is done without the cushioning effect that water provides. 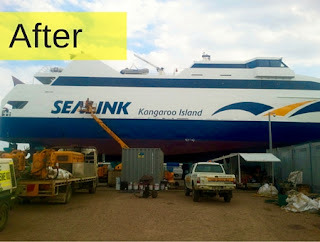 In addition, the use of water in the wet abrasive blasting process means that there is almost no dust produced, and so after blasting there is very little clinging to the surface. This is of benefit because dust that is left on a substrate when a protective coating is applied will impact negatively on its adhesiveness. Dry blasting or sandblasting does not remove dust as effectively as wet blasting, which can make the whole process more time consuming and expensive as a further clean (usually either by brushing or vacuuming) has to be undertaken after the blasting process has been completed.